Paying attention, being aware, and having presence of mind is habitual. So is distraction. On a sunny afternoon six years ago while riding my motorcycle home from Campbell River on the Old Island Highway, I noticed a pick-up truck waiting to turn from a driveway onto the road in front of me. I prepared to slow down. The pick-up rocked forward and I applied the brakes. Then the pick-up pulled back, so I released the brake and accelerated to highway speed. I reached the driveway and the pick-up suddenly pulled out. At 85 km/h there was next to no time to react. I pulled the handlebars sideways, flattening myself and the bike against the road. The impact broke five of my ribs, and the momentum of the bike carried me under the frame of the pick-up, somehow between the moving front and rear wheels and out the other side where I slid down the highway. There were many factors involved in surviving the experience. The truck being a lifted four-wheel drive allowed clearance to pass under. A fraction of a second one way or the other and I would have been hit by the truck’s wheels. I’m grateful for these factors. I’m also grateful for my practice in karate, which I have always thought improves presence of mind. It was not conscious presence of mind in the moment of that accident, but presence of mind in the repetition of a focused practice that prepares one for potentially difficult encounters. Ashleigh Johnstone, Ph.D., is a researcher in cognitive neuroscience at Bangor University, Wales. Johnstone claims that karate is a form of Attention State Training (AST), and has discovered a link between karate practice and improved alertness. 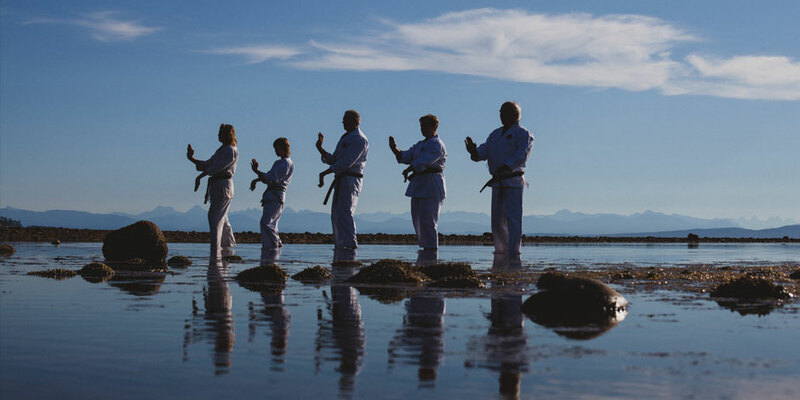 Research shows that traditional karate practice is linked with better performance on a divided attention task, in which the person has to keep two rules in mind and respond to signals based on whether they are auditory or visual. Children between the ages of eight and 11 years received training that focused on respecting other people and defending themselves as part of an anti-bullying program. The results showed that the children were able to maintain a level of self-control in challenging situations, and were more likely to help someone who was being bullied than they were before they took part in the training. They demonstrated presence of mind. Distraction is a learned behaviour, too. To the pick-up truck driver that sunny afternoon, I was either invisible, or he was distracted to the point of not noticing my distance. When we don’t have presence of mind, we miss things. Consider your own presence here. What are you noticing? How acute is your awareness? How attentive are you, and to what and whom? It’s true that all we ever have is the here and now. But how we experience it is influenced by all that has come before that single moment, including the intentional practice of presence and awareness. Mac Newton is the instructor at Toshikan Karate and Kobudo in Courtenay.